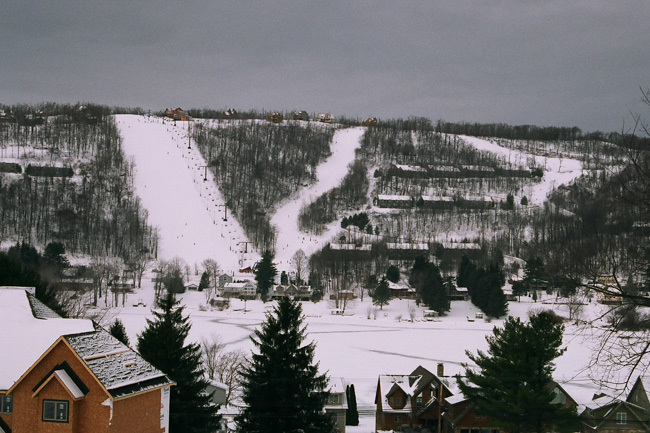 It seems odd to have only one set of pictures from Wisp as it was our favorite local ski "mountain" for many years. Perhaps I'll find some others some day. My first visit to Wisp was even before I met Jim! I went with some friends from work at the U.S. Army Computer Systems Command. I think it was probably my 3rd time on skis back in 1973 or so. This trip in 2004 was for "demo day" weekend along with PVS friends. PVS used to rent a house at Deep Creek Lake in western Maryland for at least one weekend. Those were fun days of bunk beds and shared household chores. 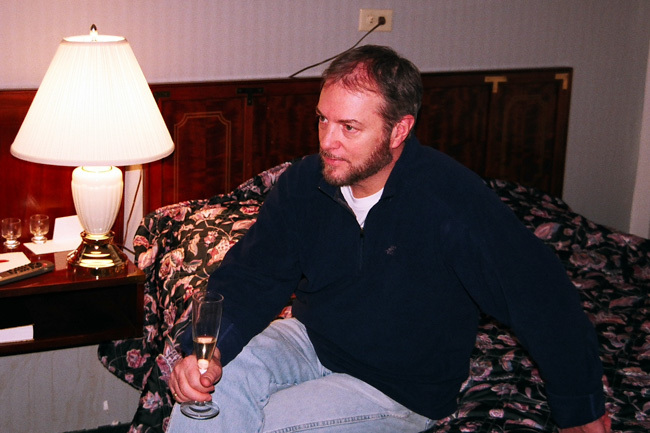 I remember one time Jim and I signed up for breakfast. About the time we were cleaning up, some of the layabeds came rolling up looking for breakfast. Our response: the lifts are open, the kitchen is closed! Another time an incipient disaster with cheese fondue was averted by a Swiss visitor who suggested the magic ingredient: lemon juice to break down the stringy cheese! Later we rented a condo for the season with two other couples. That had its own charms. On this occasion we stayed at the base hotel. It has since been upgraded out of all recognition. I guess that's a good thing. 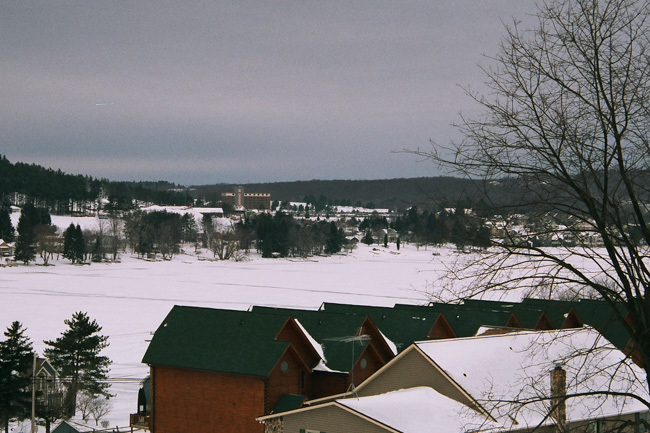 Wisp is on the shores of Deep Creek Lake, which was often frozen in the winter, as it is here. The lodge shown above can just be seen in the distance. We used to joke about the "Garrett County Line" in Maryland. The temperature might drop ten degrees between Cumberland and Garrett County. Snow would suddenly appear! Anyone looking at the USDA climate zone map can see the break between zones 6a (Cumberland) and 5b (most of Garrett County). This area of Maryland has a climate more like that of New Hampshire or Vermont! The back side of Wisp, with all the on-slope housing, was new since our first days. We welcomed it as it almost doubled the extent of the slopes. Since this time even more terrain has been developed. As usual we had après ski gatherings. 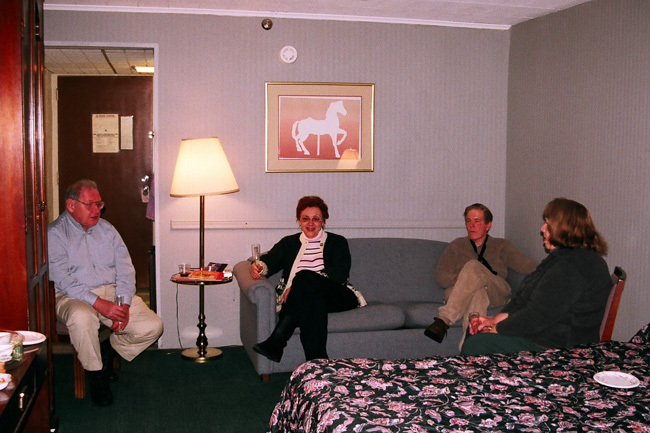 L-R are John Smith, Pat Tengel, Charlie & Sara Huggins. It was a small group for the weekend. As of this writing (2018), John is the mover and shaker for the PVS mid-week ski band that visits local resorts throughout the winter. We had recruited Jim's colleague and friend Harry Lins to join PVS as an applicant member. He hadn't skied in many years and was somewhat interested in starting skiing again. It didn't happen, but we did enjoy this weekend together. 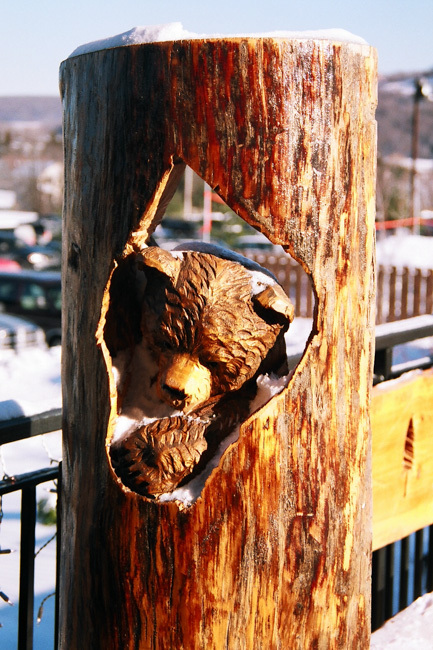 A whimsical sculpture at the base. 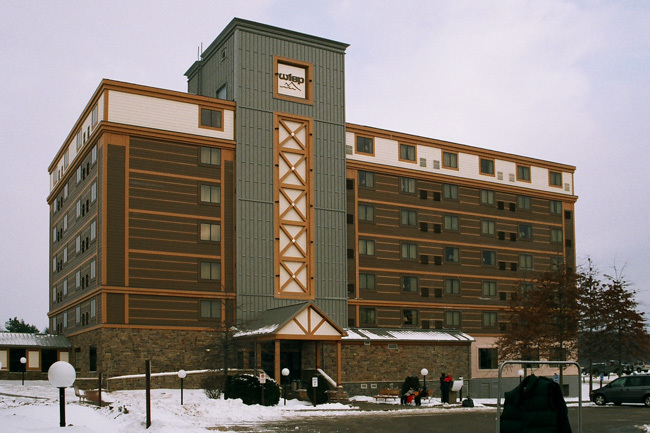 It's all very fine to travel hither and yon to ski, but we really miss going to Wisp. It wasn't necessarily the skiing that was so fine, although it wasn't bad for the Mid-Atlantic, but the friends and the experiences.